The Car 54 Where Are You? 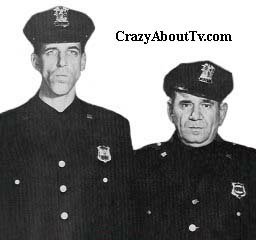 TV show was a slapstick comedy series about two very unusual police officers who patrolled an "older" area in the Bronx. Officers Muldoon and Toody worked out of New York's 53rd precinct. While real-life New York City police cars were dark-green and white, the squad car on TV was red and white. Viewers at home could not tell the difference as red and dark-green look identical when filmed in black & white. The reason for not using true-to-life colors was that the series was shot on location in New York and the producers didn't want their TV car to be confused with a real police vehicle. Fred Gwynne's persona on Car 54, Where Are You? may have been that of a somewhat "dim-witted" character, but in real life, nothing could be further from the truth! He graduated from Harvard University in 1951. He appeared in 79 episodes of the prestigious "CBS Radio Mystery Theater" from 1975 to 1982. He was also an author and illustrator of several successful children's books. Fred wasn't the only "brain" acting dumb on Car 54, Where Are You? Al Lewis had a Ph.D. in child psychology from Columbia University! He ran for Governor of the state of New York for the Green Party in 1998! Al is probably best known as "Grampa" on the series, "The Munsters (1964)" where he also worked with Fred Gwynne. He later opened a restaurant in New York City called, "Grampa's"! Thank you for visiting our Car 54 Where Are You page!